Peter the Great brought Russia from the darkness of its own Middle Ages into the Enlightenment and transformed it into the power that has its legacy in the Russia of our own century. 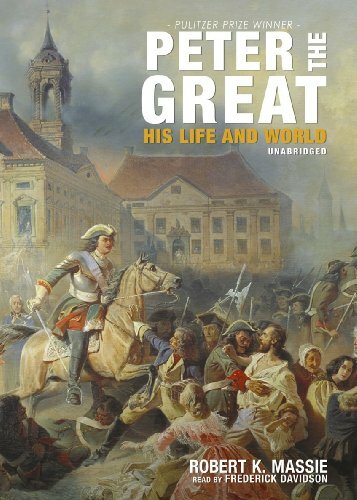 This superbly told story brings to life one of the most remarkable rulers -- and men -- in all of history and conveys the drama of his life and world. The Russia of Peter's birth was very different from the Russia his energy, genius, and ruthlessness shaped. Crowned co-Tsar as a child of ten, after witnessing bloody uprisings in the streets of Moscow, he would grow up propelled by an unquenchable curiosity, everywhere looking, asking, tinkering, and learning, fired by Western ideas. We see Peter in his twenties traveling ''incognito'' with his ambassadors to the courts of Europe; as the victorious soldier proclaimed Emperor; as the simple workman at his forge; and as the visionary statesman who single-handedly created a formidable world power. Impetuous and stubborn, bawdy and stern, relentless in his perseverance, he was capable of the greatest generosity and the greatest cruelty.